Superior grade shade sails in Canberra only make use of Rainbow Shade fabrics! If you’re looking at shade sails in Canberra, don’t make the mistake of running to your nearest hardware store. These shade sails can be inferior and may not last you any time at all. Shade sails need to be made from high quality fabrics in order to offer maximum protection. Moreover, your shade sails should be long lasting and must not degrade in a short period of time. At Rainbow Shade, we can help you find the best shade sails in Canberra. For over 25 years, we have been supplying grade fabrics to shade sail manufacturers in Canberra and across the country. As industry leaders, our products are known for their superior quality. In fact, shade sails made out of our fabrics last up to 10 times longer than inferior quality shade sails! Rainbow Shade offers four shade fabrics to shade sail manufacturers in Canberra. These include eXtreme 32, Mehler, Z16 and DRiZ, each of which features an impressive warranty. eXtreme 32 is a popular fabric that is used by manufacturers to create large, commercial grade shade sails. Along with exceptional strength, eXtreme 32 also offers great tear resistance, dimensional stability and fire resistance. All these qualities are what make this fabric ideal for large shade sails in Canberra. eXtreme 32 also offers UVR protection of up to 95.8% and is incredibly easy to maintain. We offer a 10-year limited warranty on eXtreme 32. Mehler is another commercial grade shade fabric, that is suitable for use in heavy-duty shade sails in Canberra. Made out of top grade PVC fabric, it is waterproof, UV stabilised and recyclable. The standout feature of this fabric is exceptional strength, durability and resistance to wear and tear. As a mark of quality, the robust Mehler fabric is backed by a limited 10 to 20-year warranty. 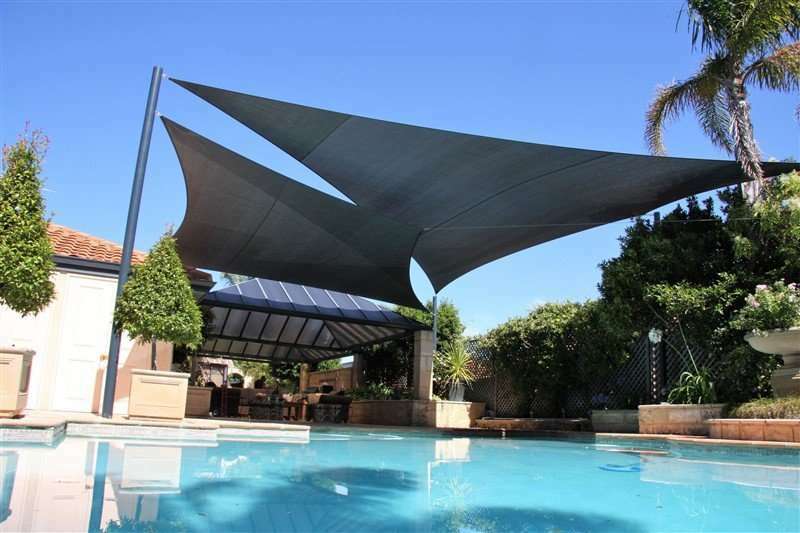 Z16 is by far our most popular fabric for shade sails in Canberra as also all over Australia. It is incredibly lightweight, which makes it easy to assemble, maintain or dismantle as the case may be. Z16 features great durability, high tensile strength and offers excellent UVR protection of up to 99%. Shade sail manufacturers love Z16 because it is available in 22 designer colours and comes with a 10-year limited warranty. Finally, DRiZ is a waterproof shade fabric, which is suitable for use in both commercial and residential shade sails in Canberra. This fabric is actually a variant of Z16, so most of its properties are similar, with the added benefit that DRiZ is waterproof. DRiZ is available in 16 designer colours and is backed by a 5-year limited warranty. For all-weather protection in Canberra, trust only Rainbow Shade fabrics in the shade sails that you purchase. Why purchase shade sails in Canberra that use Rainbow Shade fabrics? There is no doubt that Rainbow Shade fabrics offer proven durability, longevity and high UVR protection. We are the leading supplier of shade fabrics in Australia and the preferred fabric choice for shade sail manufacturers in Canberra. We’ve put in years of development and research towards creating shade fabrics that are ideal for Australian weather conditions. All our products not only meet Australian standards of quality, but exceed them as well. Shade sail manufacturers can get creative with our fabrics, as they are available in various colours. Moreover, the excellent UVR protection offered by our fabrics is unmatched in the market. Our shade fabrics are extensively used in various shade sail applications in Canberra. These include schools, kindergartens and playgrounds, residential carports, swimming pools and outdoor entertainment areas and commercial establishments! We are proud to be recognised as the leading shade fabric supplier in Canberra, as also elsewhere in Australia. We supply our shade fabrics all across Canberra, including the suburbs of Acton, Barton, Belconnen, Braddon, Bruce, Campbell, Capital Hill, Deakin, Dickson, Fyshwick, Greenway, Griffith, Gungahlin, Kambah, Kingston, Lyneham, Narrabundah, Ngunnawal, Nicholls, Phillip, Turner, Wanniassa, Watson, Yarralumla and everywhere in between. Therefore, you can rest assured – wherever you’re located, you’ll find a Rainbow Shade partner close by. If you’re looking for quality shade sails in Canberra, email us email@rainbowshade.com.au. We’ll connect you to your closest shade sail manufacturer that uses Rainbow Shade fabrics.